The Cooking Actress: James-9 Months! Sleeping Pattern: Baby boy is fairly low sleep needs so he doesn't actually get a TON of sleep during the day but his nighttime sleep has gotten longer and deeper so I'm totally ok with it! He has 2 naps during the day, that usually last anywhere from 1-2 hours (he usually only sleeps for 2.5-3 hours total) and then he is usually asleep for the night by 8 and he sleeps until about 7am! It's lovely :) His sleep routines are pretty much the same-for naps I just put him in his sleepsack and sit and sing for 1 song (or, lately, like 1 verse of a song) then I lay him in his crib. Then he falls asleep. At night we change him, lotion him, read him a story, then Michael takes him around to say goodnight to everything before reading him his superhero rules and then handing him off to me to put in his sleepsack and nurse before bed. Eating Habits: Biting during nursing has become a thing so that's made stuff interesting (I've managed to get it much better by being more vigilant about his latch, though.) He nurses 4 times a day, usually for just under 15 minutes. He's been doing amazing on the solid food front! He's eating about 3 times a day now (usually breakfast, lunch, and dinner but sometimes he'll do lunch, pre-dinner snack, and dinner if I can't get myself up and going for breakfast quickly enough). He's had SO MANY different foods and really is doing so well. On the rare occasion he runs out of food and wants more he'll usually smack his highchair tray and sometimes even say "Mo!" (Or if he wants whatever you're eating his eyes will get all big and he'll reach towards you and sort of make a begging sound haha.) When he's done he usually plays with the stuff left on his tray and shakes his head. (We've been doing the baby signs since he was 4 months old but he hasn't really seemed to latch onto them? I feel like he's so vocal he's like...nah...I'll just talk lol. He's actually said "All done!" a few times!). Development & Firsts: Ok so a lot happened this last month!! James got his top front teeth (his right on August 15th and his left on August 21st). 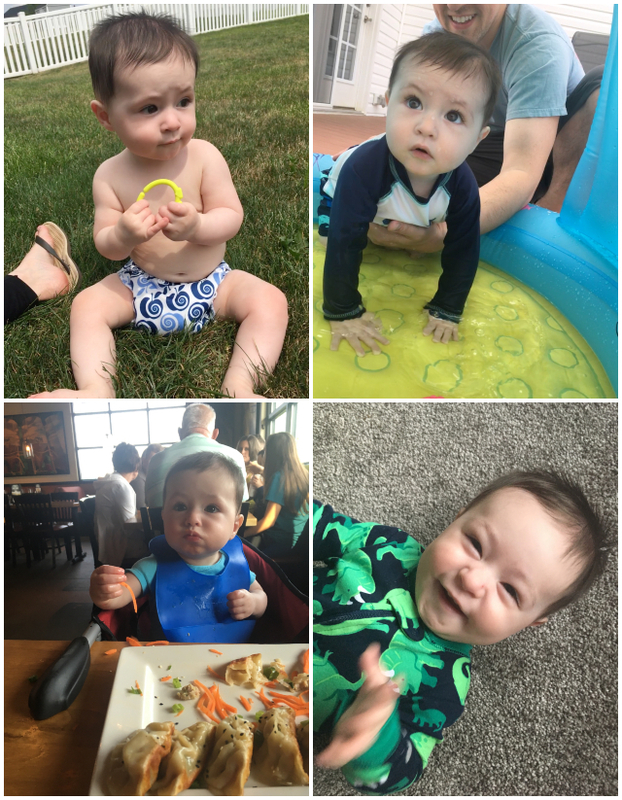 He crawled backwards on August 20th and then actually started crawling (army crawling to be specific) on August 31st. And he stood himself up (via holding onto the laundry basket and pulling himself up) on September 9th! He's on the move, to say the least haha. He also had an actually meal at a real restaurant for the first time! Michael, James, and I all went to BJ's Brewhouse (a localish chain) and we ordered James some potstickers that he loooved. Mischief: Oh this silly mischievous boy. James always loves to head towards whatever he shouldn't be into and he'll give you this look over his shoulder of like "what? what am I doing?" and/or "hehehe good luck catching me lady." The other day I put a blanket over my head while we were playing, expecting him to take it off, but instead he giggled, went, "yes!" and started speed crawling towards some stuff he's not supposed to get into. He also likes to giggle and speed-crawl away from me when I say "Where are you going? I'm gonna get you!" And this has been the month of biting-due to a combo of getting more teeth and more trying to come in. But I also think he thought (and maybe still sometimes thinks) it's funny. We're working on it and I think it's getting better but oh man the little grin he would give you when you'd say "Ow!" or just "No biting." He'd just stare at you and have the most devilish little grin steal across his face. He shakes his head "no" frequently and also just loves to scream and be an insane person, generally. Cuteness: All the same cuteness that he's always had applies!!! I will say, he's starting to look like such a little boy (his hair especially!) and I love it but it also makes me want to cryyyy. But then he's still so the same, I love when he lightly puckers his lips in his sleep, like he's done for as long as I can remember. And ah he's always doing something new and adorable! He's still really interested in Batman and smiles anytime he sees a bat symbol (which is pretty frequently around my house) and will even kiss it if it's on a towel or something. James still loves music and dancing especially but this last month we've started slow dancing and oh my gosh it's the sweetest thing. I'll hold him and we'll sway/dance around while I'm playing a song and he'll just rest his head on my shoulder. Sometimes he'll also sing during it (usually just him going "oooh" but one time he was singing, "maamaa maaa...." and I cried.) And YES the way he says dada/dad and mama/mum now is SO very clearly him addressing us and we love it and it's adorable and the best. Eating is one of the cutest things, watching how he'll GO TO TOWN on something or just make the cutest mess or study how to best approach something. We gave him a whole apple for the first time and I'm sorry but it's cute as heck to watch a baby hold and eat an apple. He also purses his lips when his mouth is full in the sweetest way (his grandpa says he has good manners, keeping his mouth shut when he's chewing.) Oh and one day Michael shared some of his food with James and then had a very serious talk about how food is best when shared. And after that James started sharing his food with us-he'll hold it up to you with the sweetest, most earnest, expression on his face. It melts your freaking heart. We also pray before dinner, usually, and he loves it. While we do "bless us oh lord" he smiles and looks so happy. What else does he do that's cute....he uses his fist to do the "wah wah wah" thing, a lot. It's so funny. 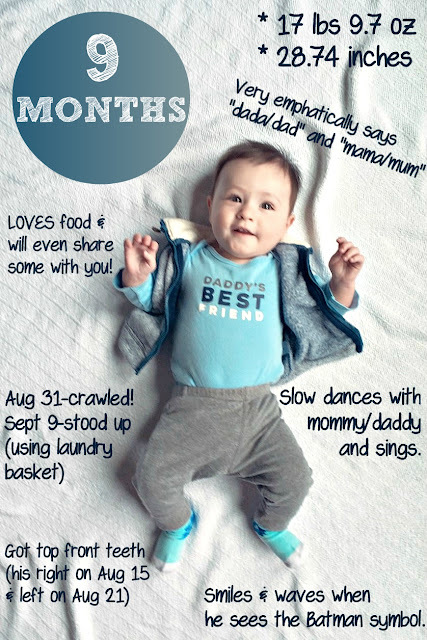 Now that he crawls he also loves to speed off towards things while looking over his shoulder for you and giggling if you chase after him/make it seem like he shouldn't be going there. He has peeked his head around the corner of the laundry room when I've been in there a couple times and it cracked me up. I could hear him crawling on the tile floor and then pop! There's his cute little head and adorable little grin. Every moment of every day is full of cuteness (it's even cute when he's trying to eat my hair). I'm obsessed. Nicknames: James-y, Jamesy-pie, Nugget (or Nug or Nuggy or Nuggy Nug or Nuggety or Nougat), Noodle, Godzilla, Cutie McCuterson, Cuddle Bug, Snuggle Bunny, Hedgehog, Mister, Sir, Bud/Buddy, Friend, Sweet Boy, Baby, Love (My love, little love, sweet love, lovey), Cutie patootie/pie, My Sweetie/Sweetie-pie, The Baby, Little/Sweet/Baby Boy (or any combo with any of the other nicknames listed-particularly Sir Baby and Mister Boy), Baby-man (Michael calls him this). Dislikes: Sometimes vegetables (gah). Taking anything he wants away from him/telling him he can't have something. The car. Overwhelming situations/big crowds. Not being able to sleep. Teething. Tummy aches (had our first one this month and it was sad). Not being paid attention to in too long. Not being with mommy/daddy. Concerns: Figuring out the biting situation has been hard but I think we're getting better! A Day in the Life: James wakes up around 7am (sometimes I'm lucky and he sleeps in until 7:15 or 7:20!) and then I nurse him. We then either go have some breakfast (usually some combo of like fruit, toast, cheese, oatmeal, yogurt, stuff like that.) or hang out and relax and spend time with daddy before he goes to work. After playing and such I put him back down for his nap around 9:30am. I get him up at 11am and nurse him. We then have lunch (which could be any number of things) and after that if we have errands we'll run them or we'll just play or do some playing and some of him playing on his own while I clean/cook/do dishes, etc. He goes back to sleep around 2pm and then gets up anywhere from 3:30-4 usually. I nurse him and then we might have a quick snack or just play/have him play while I cook dinner. After Michael gets home we all eat together and then have a little bit of playtime before our nightly routine. I nurse him at 7:30 and he's usually asleep and in his crib between 7:45 and 8 (sometimes he falls asleep while nursing and sometimes he falls asleep after I've put him in his crib).